Management at Florida’s Disney World theme park, maintaining a bright, level tone and a chipper, rigid composure, have requested that visitors to the park no longer use selfie sticks while riding on the rides. “The rides move very fast, you see,” the company did not go on to add, a hint of a twitch flickering in the corner of its glimmering eye. 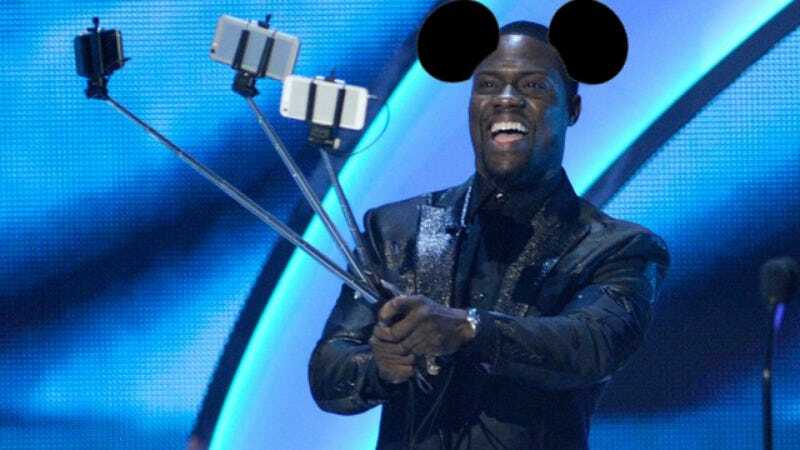 “And waving around metal poles with cell phones on the end might be dangerous.” Disney joins music festivals Coachella and Lollapalooza in banning the “narcisisstics,” which allow users additional angles and reach when taking pictures of themselves with their phones. To be fair to the monolithic company, though, it’s relatively unlikely that selfie-stick usage at Coachella would end with a four-year-old getting a concussion because some butterfingered shutterbug accidentally hurled his pricey camera toy with all the rotational force of a ferociously spinning teacup. Disney did note that visitors were welcome to use the sticks in parts of the park that did not involve people being rapidly propelled through space at velocities reaching as much as 30 miles an hour. So there you go, selfie stickers: feel free to take all the pictures you want of yourself around the park, content in the knowledge that the dehydrated, Orlando-born teen with the Goofy-suited arm around your shoulder does not hate you for fiddling with your camera while he slowly sweats to death, and does not wish to beat you with your stick.